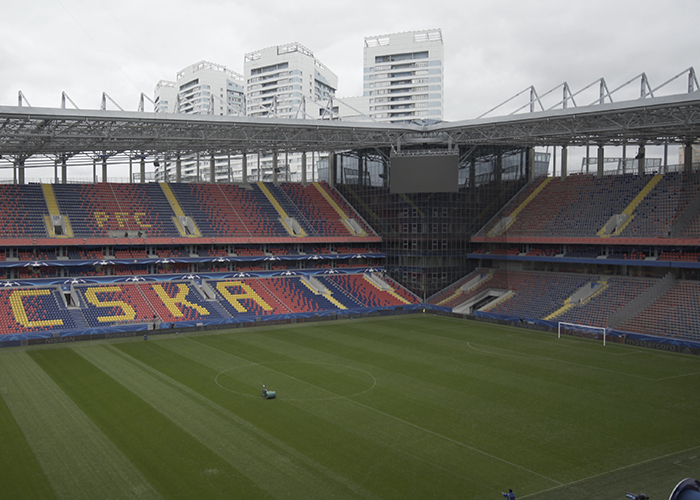 The brand new 30,000 capacity, multi-use Arena CSKA was officially opened on 10th September 2016 after a construction period of 9 years which mounted up costs of US$ 350million. 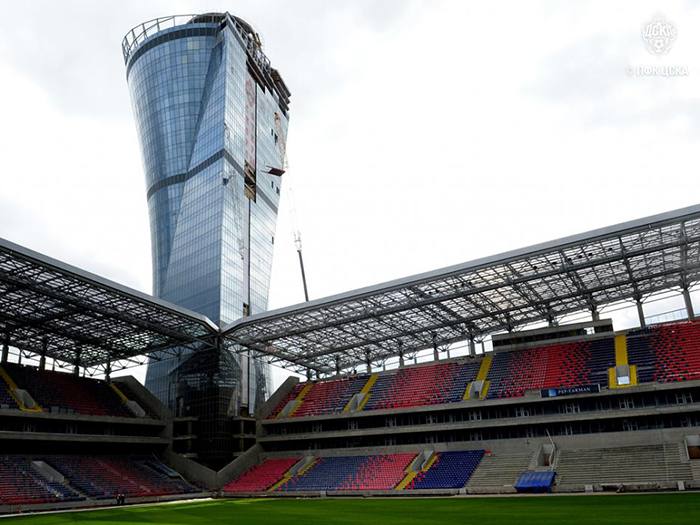 The stadium, home to CSKA Moscow Football Club hosts a 48-room hotel, office space, and a 38-storey skyscraper standing in one of the stadium’s four corners. 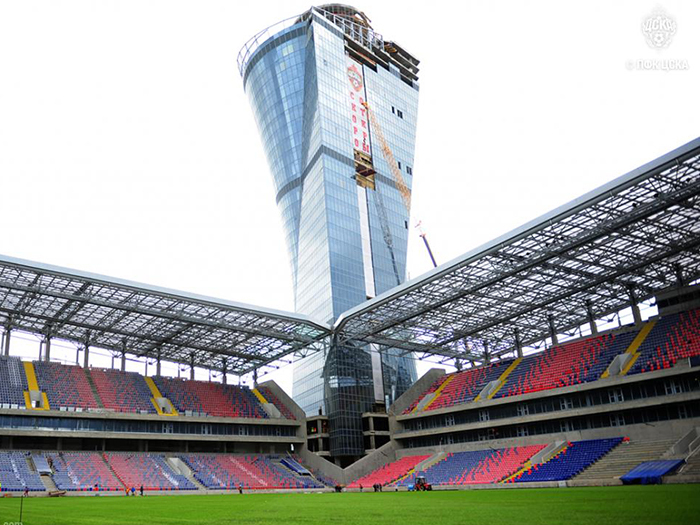 At a height of 142-metres, the skyscraper is modelled on the UEFA Cup won by CSKA in 2005 which was the first European trophy ever lifted by a Russian team. The home football fans of the previous stadium were unhappy with the speech intelligibility which was poor in some areas of the stadium so the new stadium was to therefore fix to this particular issue. Using acoustical calculation software OKNO Audio, who were selected to complete the work, were able to identify the particular audio products that would deliver audio clarity to all areas of the stadium, including indoor spaces. The stadium now benefits from a Dante network that feeds an entire audio solution from MUSIC. For the main open-air arena they selected Turbosound Athens TCS152/94-R (x16) and TCS152/64-R (x32) speakers distributed in clusters of three, in sixteen separate hangs. The upper and lower Athens speakers systems have 60×40* dispersion and the central speaker has 90×60* dispersion with Turbosound’s rotatable Dendritic Waveguide. 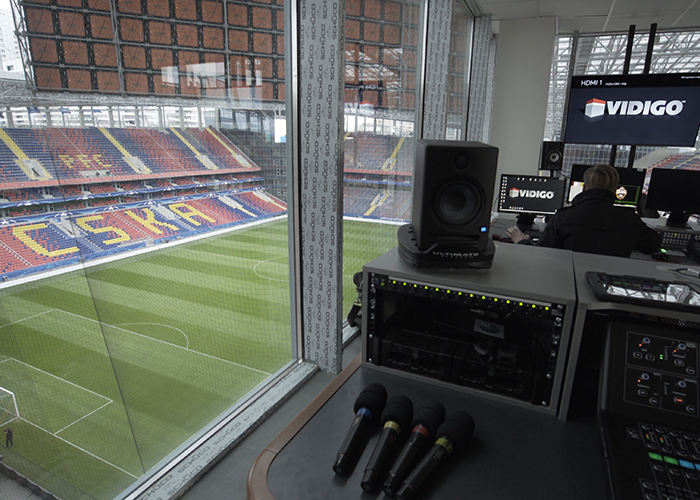 Turbosound helped in designing the high frequency drivers which now deliver clear and crisp sound throughout the stadium. Additionally OKNO Audio developed a suspension method for easily attaching a speaker from the cluster for maintenance purposes. In the conference hall and public areas inside the stadium 216 Tannoy DVS4t are deployed. Some of these are installed in the stands to provide further sound reinforcement to the audience areas. The DVS4t is an ultra-compact 160 Watt surface mount loudspeaker that provides exceptional acoustic performance in both stereo and mono music applications. 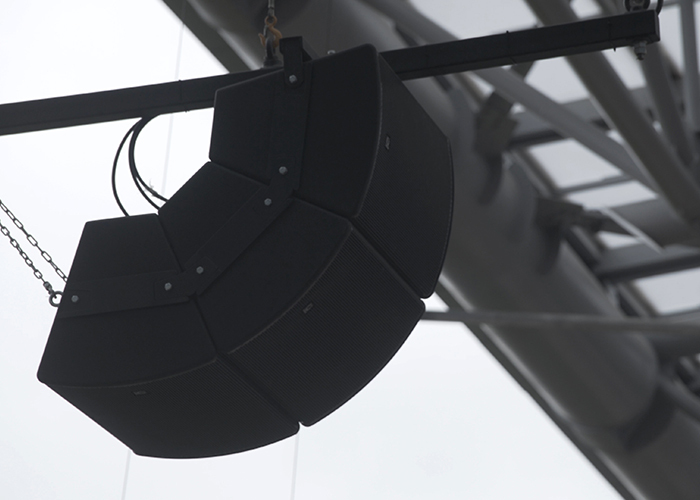 Optical lines connect all loudspeakers which allow the underground team conference room audio to be played in the main stadium – the optical lines transfer all audio and visual data around the stadium. The entire system is powered by 14 Lab.gruppen D80:4L amplifiers which each offer 8000W of flexible power with the latest Lake Processing DSP, Dante digital audio networking and advanced system integrity monitoring. At the core of the award-winning D Series is Lab.gruppen’s Rational Power Management (RPM) technology which allows the re-allocation of output power capacity among the four available channels, leaving any remaining power to be allocated to other channels. This results in extreme cost efficiencies and reduced rack space for the stadium. The 14 amplifiers were introduced into in an extremely harsh environment, with extreme temperatures and no ventilation, but to this day have no failures. For sound mixing, a MIDAS M32 digital mixing console is deployed in the audio technician’s room where all monitoring takes place.